Growing up in a Mauritian-British household, this quick and easy dish is one that would appear regularly on the family dinner table. So regularly, in fact, that by the time I left home for University, I got a little tired of chicken daube and rather predictably and shamefully replaced it with pot noodles and pasta. Now I’m a proper grown-up who has admitted pot noodles aren’t actually food, I’ve started cooking it again for my own kids. I’m pleased to say that they have embraced it whole heartedly and in the process I’ve rediscovered my love for this delicate dish that is, for me, the essence of home cooking. Try it for yourself and I promise you won’t be disappointed! 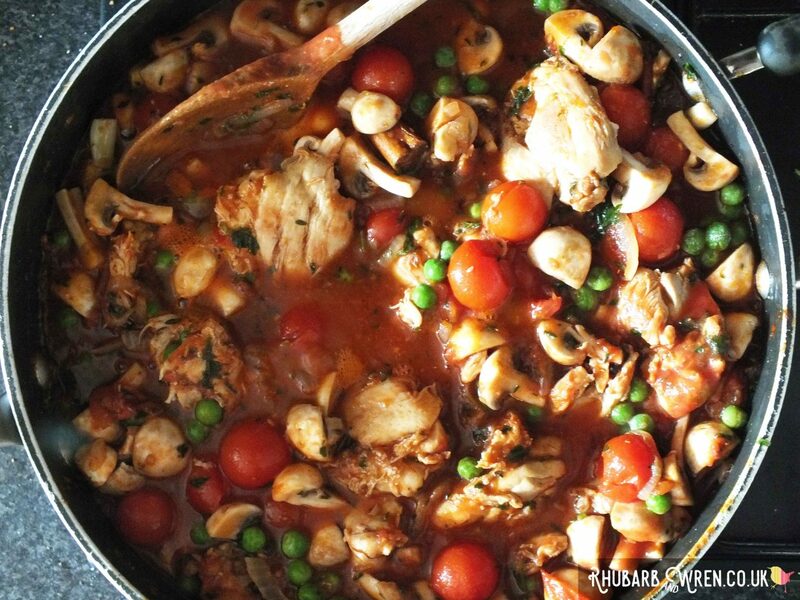 Golden pieces of chicken in an aromatic, tomato-based sauce, delicately flavoured with thyme, cloves and cinnamon. Mmm, home-cooked chicken daube! 1 large brown onion, sliced. 6 garlic cloves – peeled but whole. Generous handful of fresh thyme (dried will do at a pinch, but fresh makes a noticeable difference). Strip it off the stalks before cooking. 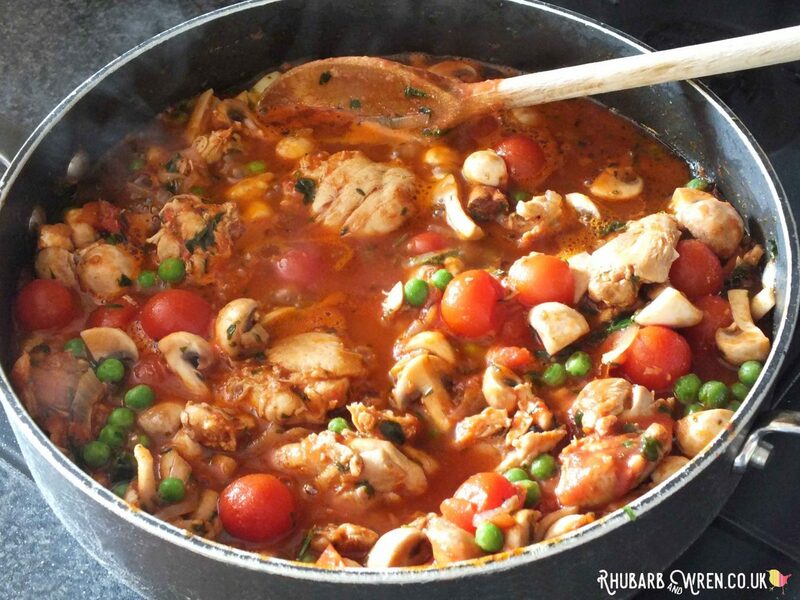 This chicken daube recipe is cooked entirely on the hob, in a large pan with a lid, and takes under an hour from start to finish. Making this quantity will serve a good portion to about six people. Sprinkle the uncooked chicken with a little ground black pepper and ground cinnamon (no more than a teaspoon of each), and fry the chicken on a high heat until golden. Make sure the chicken is cooked through (if necessary on a lower heat once browned). Lower the heat, push the chicken to one side of the pan and cook the onions on the other, stirring it into the bits of chicken and the chicken-flavoured oil left in the pan from the first stages. Add the garlic cloves once the onion has softened. Fry for a couple of minutes. Add the fresh thyme and stir in with the onion and garlic. Cook for another minute before adding in the whole cloves, peppercorns and cinnamon stick (I tend to crush this just a little first). Stir and cook for another minute or two – don’t let the mix burn so make sure to keep stirring every now and then. Stir in the baby button mushrooms (quarter these first unless very small) and the tin of cherry tomatoes. Cover and simmer for approximately fifteen minutes, then stir in the peas and chopped flat-leaf parsley. My dad would add these in with the mushrooms, but I prefer to do this at the very end so that they keep their green colour. Cook for about another five minutes, then add salt (and pepper) to taste, before serving. Chicken daube is traditionally eaten on a bed of fluffy basmati rice, but it also works well served with some crusty bread. If you’re going to serve with bread only, you might want to put in some potatoes when you stir in the mushrooms. The potatoes should be peeled and quartered, but there’s no need to par boil unless the pieces are very big. They help thicken up the sauce a little and makes the whole dish go that bit further. Including potatoes is a Grand-Mère approved variation – everyone in my family is in agreement that potatoes are a can-if-you-like addition… but there are other options that are a little more contentious! Even within my family there is much disagreement over exactly what should be used in the perfect chicken daube. Parsley, for example, is highly controversial – my dad insists all daubes (bar one) should have parsley. His exception is a Chinese cabbage daube – this apparently should never have parsley, because that would be an affront to nature. However, my mother (who is Welsh, not Mauritian, but was taught this recipe – back in the seventies – by my Mauritian grandmother) insists that NO daube should ever have parsley in it. As her logic is somewhat dubious, I’ve made it both ways, and I tend now to add a generous handful of roughly chopped, flat-leaf parsley. I find it helps intensify the herby flavour of the dish without overpowering the warm undertones of cinnamon and cloves. 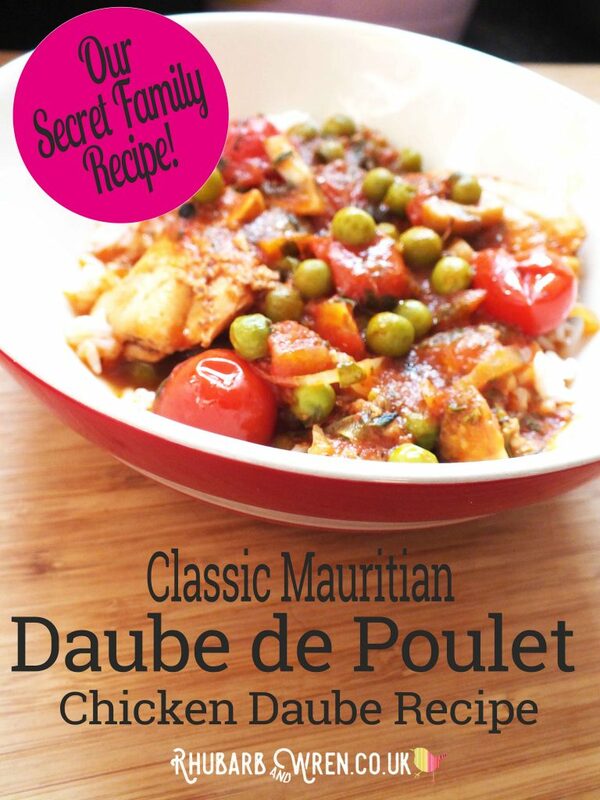 Tinned tomatoes are absolutely key to this dish – as they are, it seems, to most Mauritian cooking. We used to joke that my dad couldn’t cook a cake without adding a tin of tomatoes and some onion and garlic… Now, we don’t joke, we just admit it’s completely true. But even with the tomatoes, there can be disagreement. My dad specifies whole plum tomatoes, which he then chops in the pan. My mum says this is ridiculous and pointless, and uses chopped tinned tomatoes of any sort (usually Italian). I tend to agree with her on this one, so that’s what I use. However I’ve added to the drama by my own addition to the chicken daube recipe of a tin of whole cherry tomatoes (on top of the essential chopped/plum toms). I got some very speaking looks when I served this up to my dad, who poked around at them like they were live grenades. He did admit they were ‘not bad’ in the end though! Finally, a note on the chicken – I tend to use a packet of thigh fillets in a chicken daube because I’m lazy, but you can/should (according to my elders!) use meat on the bone. As a child, my parents usually made this with a whole chicken, roughly portioned. Frankly, this dish works with whatever bits you want to use, but I’d recommend thighs over breast meat if you’re going for fillets. Chicken daube is a classic one-pot, stove cooked dish – and this recipe makes cooking a classic easy-peasy! If you’ve enjoyed this, why not take a look at some of our other family-favourite recipes! Nigella’s Spring Chicken is one of our family favourite recipes! Look at this kid-pro pancake roller go!